Minus – Social Chat, is a new chat and photo application that lets you interact and meet new friends from all over the world. When you first launch Minus you will need to create a profile, You can either fill in all of the information or use your Facebook info. Next you will have to upload or take a photo to be used as your profile picture. Minus includes one of the best photo editors around. You can apply stickers, effects, draw, create a meme, enhance, change the orientation, add a frame, change the sharpness, add text, reduce redeye, whiten teeth, and patch blemishes. Will all of these great photo editing tools you can be sure to add a great picture of yourself to share with others. Once you have created your account you will see the Explore window, just swipe the map to see who’s online. From here you can see all of the minus users near you. You will be able to see their name, age, a picture of them, their status, and their score. You score is determined on how many stars you have gained. To earn stars you will need to get people to fave you, so post some great pictures, a clever status, and enjoy a great conversation. When you decide you want to message a certain person you can click on their picture and it will bring up their profile. You can then browse all of the photos they have posted, add them to your favorites, or send them a message. When you compose a message you can also send a long a picture, share your location, and share a contact. Minus also includes a bunch of emoji icons you can use as well. Some other very cool features of the Explore window is the airplane mode. This will also you to virtually jet anywhere in the wold so you can see Minus users from all over. See someone you like and start chatting with them. I also like the feature of the photo explore. Instead of browsing pictures of Minus users, you can browse photos. If you happen to find some cool pictures you can instantly connect with the user who posted them. There is also a search bar at the top so you can quickly find people based on a keyword. From your profile menu you are able to change your status, set your hometown, write a few words about yourself, share your hobbies and interests, list your education and current occupation. Not only that but you can connect your Facebook, Twitter, Instagram, and Tumbler accounts. I would also highly recommend that you verify your email. This will put a check mark next to your profile picture so other Minus users can see that you have verified your account and are a real person. Overall Minus is a great application and very well designed and laid out. It has been updated with an iOS 7 look and is visually appealing and professionally designed. This is a great tool to meet a ton of new people from all over the world and is not just a dating application, although it can certainly be used to find that special someone. Minus Social Chat is a Free application available on the App App Store. 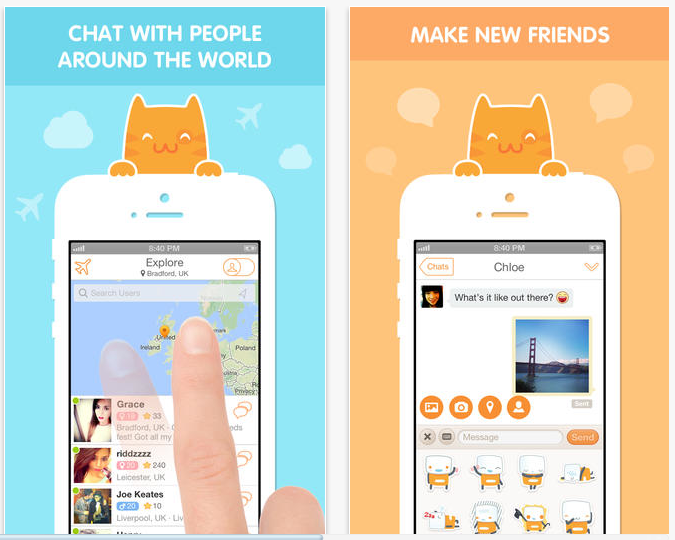 With Minus – Social Chat you can make new friends, “Minus” the distance.